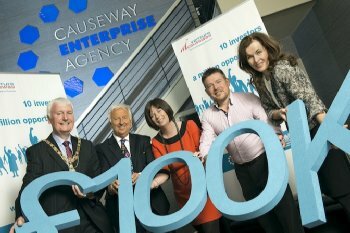 Ten local business champions have teamed up with Causeway Enterprise Agency, to create a £100,000 pot of gold to develop “Venture Causeway” an exciting new venture capital competition sponsored by Coleraine Borough Council and the University of Ulster with the core aim of sparking innovation and job creation in the Coleraine area. The cash will power the Venture Causeway competition, developed to inspire, encourage and support entrepreneurship in Coleraine, and will help grow the local economy as well as create employment opportunities in the Coleraine area. The competition is open to both existing and new businesses and is open to all sectors and sizes of businesses and start-ups with the only condition being that all applicants’ businesses must be located in the Borough of Coleraine. If a new business is to be created, the applicant must agree set their new business up within the Borough of Coleraine. To enter the competition, all budding entrepreneurs need do is complete and return their application form. If shortlisted, they will be invited to pitch their business idea to our Champions in a Dragons’ Den style setting at Causeway Enterprise Agency. - Professor Deirdre Heenan, Provost, University of Ulster, Coleraine campus, sponsors of marketing and PR for the Venture Causeway competition.